Tom, an explosives technician with the Marines, had served four clean combat tours before his life was turned upside down. During the fifth tour, his second deployment to Afghanistan, a homemade bomb exploded beneath him, severing both his legs, an arm, and leaving him with very little eyesight. In the face of these life-threatening injuries, Tom has spent about two and a half years recuperating at Walter Reed National Military Medical Center, beating the odds, and, as a result, finding a new stride in his approach to living. With such a grueling injury, Tom has mustered a lot of stamina, and his commitment to getting well has certainly impressed the team at Freedom Alliance. As his time of treatment is ending at Walter Reed, we wanted to wish him well and celebrate this significant milestone before he moves to a home in North Carolina. 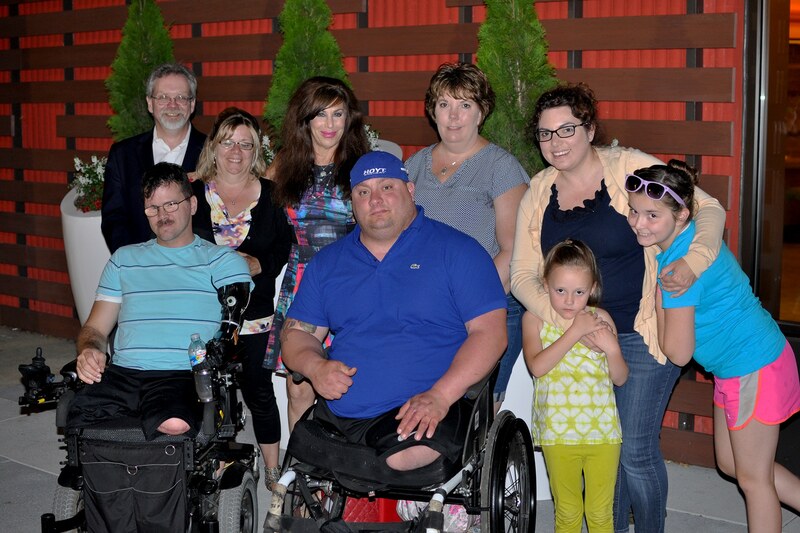 We invited Tom and his family and friends to join Freedom Alliance at the Cheesecake Factory, Tom’s favorite restaurant, for a night to commemorate. In attendance were his mother, five-year-old daughter, fellow Marine and Walter Reed patient Christian, among other friends, including two writers who are working on a book about Tom and Christian and their caregivers. It will be a challenging move, but we know Tom is up for the ride. For Marines like Tom, every day the fight for survival continues. But with their remarkable will to recover, along with help from world-class medical facilities, such as Walter Reed, dedicated family members, and maybe even a bit of support from Freedom Alliance, we can see our wounded heroes triumph.